RICHARD S. D. ROBERTS was born in Henry County, Ky., September 15, 1822, and died September 17, 1892, when two days past three-score and ten. 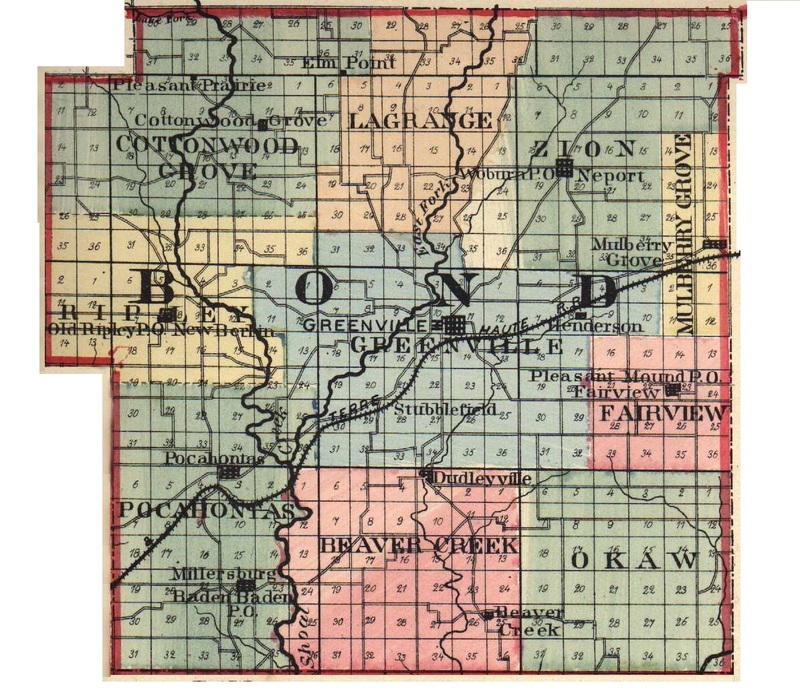 He was a prominent farmer of Bond County, and resided on section 3, Mulberry Grove Township. His father was an early settler of this county, having come hither in 1822 and settled on Government land, but did not make this place his permanent home. After residing here for about two years, he removed to Vanburensberg, Montgomery County, where he remained for many years. The father of our subject was born in Bardstown, Ky., in 1780, and was there reared to manhood. In his native State he married Sarah Simmons, who was born in Henry County, Ky., and died after her removal to Montgomery County, Ill. All of her thirteen children grew to maturity and all married with one exception. Grandfather Simmons was one of the soldiers in the war for independence and when the last record of him was received he was still living, at the unusual age of one hundred and fifteen years. Whether the climate of their home tends to longevity, or whether that fabled spring whose waters give everlasting youth was shown this remarkable man and his wife, cannot be discovered, but true it is that the grandmother of our subject, the wife of the patriarch, lived seven years over a century. This certainly is a most interesting fact, and one of which the family of Mr. Roberts is justly proud. The grandfather of our subject, Benjamin Roberts, was a native of Virginia and came to Kentucky at an early day, even before the great Daniel Boone performed such valorous deeds in that State. The ancestry of the family was English-Welsh, and that combination has always made a race which has borne well its part in the battle of life. The surviving members of the family to which our subject belonged are a sister who bears gracefully her eighty years, and a brother who lives in Colorado and admits his seventy-six years as another might acknowledge his fiftieth. Our subject was the eleventh child in a family of thirteen children, and was two years old when he came to Illinois. His first school experience was not very pleasant, as the two-mile walk through the woods was a long one for a child, and the place not very inviting when he reached it. The house was made of logs, the puncheon seats were hard, and the master made up in authority what he lacked in knowledge, and altogether the road to learning in those days was a hard one to travel. What education the children received was really earned. In the days of which this is written, when large families were the rule, as soon as boys grew to be of use their school days were over. This was the case with our subject, and his help was required on the farm because the whole work had to be done by manual labor, as this was before the days of machinery. July 27, 1842, Mr. Roberts was joined in matrimony with Miss Mary R. White, who was born and reared in Loudoun County, Va. This worthy lady bravely bore her part in the pioneer life of the day, and won the regard of all with whom she came in contact. After his marriage, our subject located where the family now resides. He built a log house and there lived until the breaking out of the Mexican War. Then with patriotic fervor he enlisted in Company E, Third Illinois Infantry, and served for twelve months. Entering as Corporal he was promoted to be Fourth Sergeant, and received his discharge at New Orleans in 1846. After the close of the war, he returned home, and by industry became the owner of a farm of two hundred and fifty-two acres of land, all of which he cultivated. It was wood and prairie, but he made a beautiful home out of what was once a wilderness. The beginning of Mr. Roberts' life was as that of many others of the self-made men of the county. His means were small, but he possessed energy, sagacity, and an abundance of industry, and has made himself the owner of one of the finest farms in the county. Mr. and Mrs. Roberts became the parents of the following children: Mary E. is the wife of Hardin Elmore, whose sketch appears elsewhere in this work; James H. is a merchant at Newport, Ill.; Julia Stark is the wife of Frederick Durr, of Bond County; Elizabeth, formerly the wife of Frederick Kimball, is now deceased, and of the three children that she left, one is married; George W. died at the age of eighteen years; Richard S. and Stephen Douglas live in Bond County. Our subject was a general farmer and stock raiser. He was a Democrat in his political faith, and was always ready to give his opinions upon the general topics of the day. The branch of the church known as the United Baptist was the religious denomination with which our subject affiliated and in which he held the office of Deacon. He was prominent in his church for many years and contributed to its support liberally, while he also aided in the Sunday school work. One of the important families in Bond County bore the name of Gilham, and were the first settlers here. At this time there are none of the old name to give a sketch, and as this family is connected by marriage with the family of the subject, it does not seem out of place to insert it here. Charles Gilliam built the first mill in the county, where is now Mulberry Grove, about five hundred yards northwest of Mr. Roberts' house. He was a prominent man, well regarded and respected by all, and was a member of the Presbyterian Church. A sister of our subject married Newton Gilliam, and one of his brothers married Sarah Gilham. All of these are now deceased. The full name of our subject is Richard Stephens Dorsey, and he was the namesake of a good old man, the family physician in the old home in Henry County, Ky. Our subject ever honored his name by his life. Throughout this beautiful and prosperous county, none were more highly regarded in the neighborhood than he. Extracted 29 Nov 2016 by Norma Hass from 1892 Portrait and Biographical Record of Montgomery and Bond Counties, Illinois, pages 124-126.